With clean lines and soft shapes, the Avalon Platform Bed brings a contemporary styling to your bedroom. Crafted from Poplar and Pine Solids with Cherry veneers, it features a beautiful dark or white truffle finish that emanates warm brown tones to soothe and comfort. Framed paneling on the headboard gives it an edgy look, adding visual detail to draw eyes from across the room. 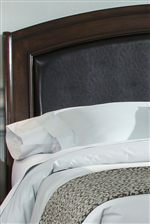 The grandly-scaled headboard slightly arches, lending a sense of shape and movement with its presence. Tapered feet support the coordinating footboard. Simple with just enough detail to keep you interested, the Avalon Platform Bed makes it easy to enjoy classy style and solid structure in harmony. This bed is available in Queen and King sizes. The Avalon King Platform Bed by Liberty Furniture at A1 Furniture & Mattress in the Madison, WI area. Product availability may vary. Contact us for the most current availability on this product. 505-BR24R King Platform Rails 1 82" 2" 13"
505-BR24F King Platform Footboard 1 80" 3" 16"
505-BR24H King Platform Headboard 1 80" 7" 52"
The Avalon collection is a great option if you are looking for Contemporary furniture in the Madison, WI area. 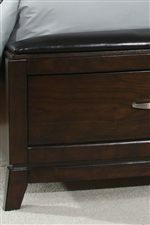 Browse other items in the Avalon collection from A1 Furniture & Mattress in the Madison, WI area.